Trying to set up .dir-locals to use a custom python interpreter inside a container so i can use run-python and get the REPL inside the container. I have this setup which seems to partially work in that its trying to use the interpreter i have specified. However I just get the below error. I assume its something to do with the added slashes. 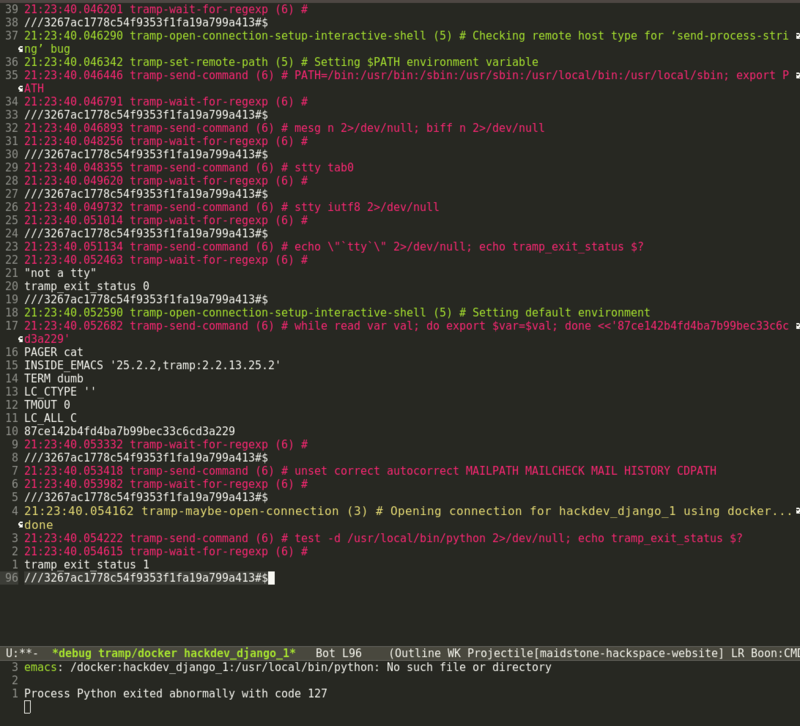 tramp-error: Not a Tramp file name: "/docker\:hackdev_django_1\:/usr/local/bin/python"
If I use find-file and navigate to the bin folder that works, and using the which command tells me that the path is correct inside the container. So I am at a bit of a loss. I tried upgrading but I could not convince Emacs to use my downloaded version over the built-in version. Looking for next thing to try. Is this perhaps a known bug ? The python shell calculate command runs the docker command through shell-quote-argument which is adding the slashes and breaking things. I then have to add (setq tramp-histfile-override "/dev/null") to get around another issue where it looks for a history file which does not exist. Currently running the code below to progress. "Calculate the string used to execute the inferior Python process." using C-x C-f I can type /docker:hackdev_django_1:/usrlocal/bin/py tab and have it list python. Browse other questions tagged python debugging tramp or ask your own question. How can I use my local Emacs client as the $EDITOR for remote machines I access over TRAMP? How to specify python to use in emacs on os x?